The negotiated conference budget expects the state’s tax system to raise $22.3 billion in base General Fund revenue. This available base revenue is greatly constrained by previously approved tax cuts in recent years, and additional tax cuts in this final budget further reduce available revenue. In addition to base revenue, lawmakers rely on revenue collections coming in above what officials anticipated ($580.6 million); money they anticipate agencies will return to the state (known as reversions, estimated at $271 million); non-tax revenues ($849 million); and unappropriated dollars from the most recent fiscal year ($208.6 million). In total, $23.6 billion in revenue is available to lawmakers for public investments for fiscal year 2018 (FY18). The second year of the budget uses $499.2 million of available revenue for FY18 to fund public investments for fiscal year 2019 (FY19). This reliance on prior year’s revenue raises concern, as the state’s tax system already falls short of raising adequate revenue to meet the growing needs in the state. This reality of an inadequately structured tax system and the use of prior fiscal year revenue, reflects the long-term challenges the state will face in ensuring that adequate revenue is available to meet the basic responsibilities of a growing state. Year-over-year annual General Fund appropriations increase by $621 million in the final budget. However, around $1.1 billion in additional revenue will be needed in going from the first to the second year of the two-year budget to account for enrollment growth in public education, to pay for rising costs in the delivery of Medicaid services, to meet retirement and health plan obligations for public employees, and to fund the teacher pay plan. This suggests that existing obligations will either not be fully funded or cuts to public services are on the horizon, or a combination of both, in order to fund these ongoing obligations. 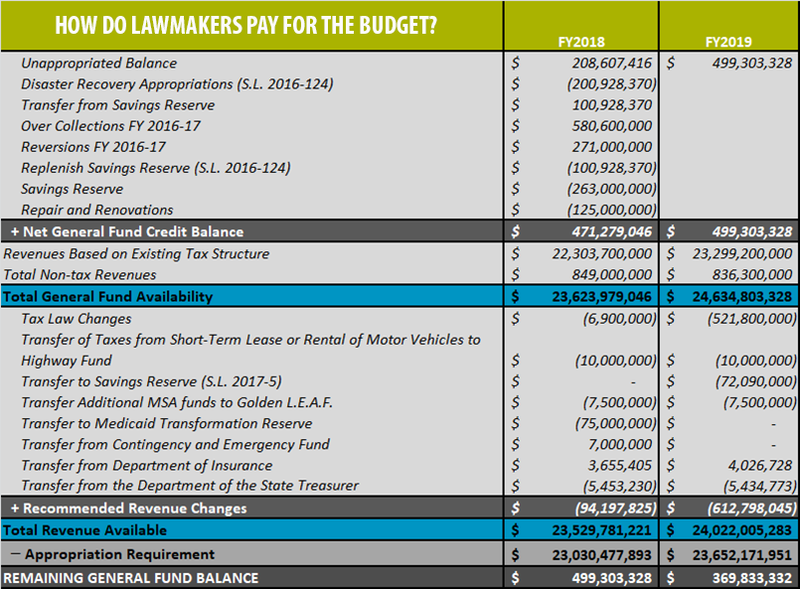 How do lawmakers pay for the final budget? The final budget includes a required transfer of $100.9 million of General Fund dollars to the state’s Savings Reserve fund, per the special session disaster relief bill passed by state lawmakers in December 2016 to aid communities harmed by Hurricane Matthew. Furthermore, lawmakers stash an additional $263 million in available revenue into the Savings Reserve fund and another $125 million is set aside in the state’s Repair and Renovations fund. More tax cuts in the final budget builds onto tax cuts in recent years that have reduced available General Fund revenue. Tax cuts in the final budget largely begin in the second year of the budget and will reduce annual revenue by $521 million for FY19. The full cost of the tax cuts – reflected by the loss of annual available revenue – is not reflected in the final budget because the tax cuts will only be in place for the second half of FY19. Accordingly, the cost of the tax cuts will be higher than the $521 million price tag included in the budget, meaning a further reduction in available revenue for public investments in the years beyond the two-year budget. Cedric D. Johnson is a Public Policy Analyst for the Budget & Tax Center, a project of the North Carolina Justice Center.